The department of Social Science of M. M. Modi College, Patiala today organised a seminar on ‘Youth Awareness against Drugs’. The principal of the College Dr. Khushvinder Kumar inaugurated the function with a pledge against Drugs with signature campaign. 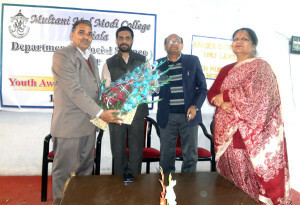 Dean Students’ Welfare Prof. Ved Parkash Sharma welcomed the Principal on this occasion. Principal Dr. Khushvinder Kumar in his address highlighted the problem with special reference to Punjabi Songs. He highlighted few punjabi songs which instigated youth towards drug abuse. The main highlight of the programme was that it was organised by the students under the supervision of Social Science faculty members Ms. Daljeet Kaur, Ms. Priyanka Malhotra, Ms. Neelu Shukla, Ms. Rakshi, Ms. Navshagan Deep, Mr. Harvinder Singh, Dr. Prem Sharma and Sh. Dharampal Singh. The College students Ravi Singla, Gurpreet Singh, Shristhi, Tanuj Lamba and Abhishek Yadav presented their views regarding Drug addiction. Ms. Puneet Kaur of BA-III conducted the stage. Dean Arts Prof. Poonan Malhotra, Prof. Baljinder Kaur, Prof. Shailendra Kaur, Prof. Jasbir Kaur, Dr. Ashwani Sharma, Dr. Rajeev Sharma, Prof. Jagdeep Kaur and other dignitaries were present on the occasion. Vice Principal Dr. Vinay Jain proposed the vote of thanks.